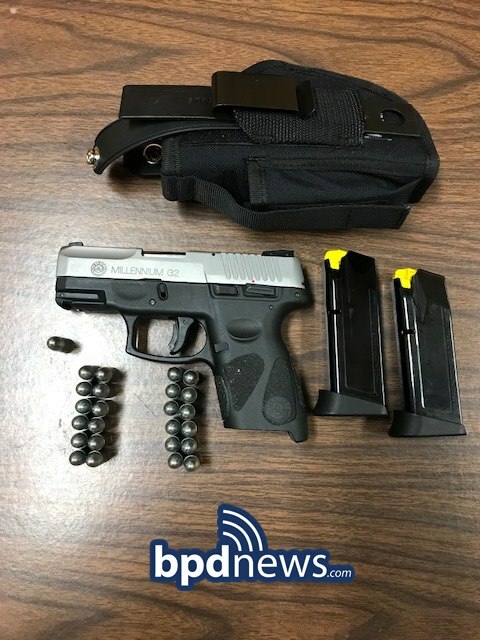 At about 6:50 PM on Sunday, May 27, 2018, members of the Boston Police City Wide Drug Control Unit conducted an investigation in the area of 100 Washington Street, Dorchester. As a result of the investigation, officers recovered a loaded black and grey Taurus Millennium G2 9mm firearmthe two individuals. Officers arrested Ernest Perez-Alicea, 46, and Casey Edwards, 34, both of Fall River, in connection with the investigation. Perez-Alicea and Edwards were both charged with Unlawful Possession of a Firearm, Unlawful Possession of Ammunition, and Possession of a Large Capacity Feeding Device. Both suspects will be arraigned in the Dorchester District Court on Tuesday.